Thanks to many years of experience in the field, Adel can provide the perfect solution for various ticketing applications, such as access control systems, pay toll systems and parking management systems. The EMTS_E and ENC RISC_E modular systems allow the creation of a flexible and comprehensive range of reliable devices composed by a main module coupled with optional devices. With these combinations it is possible to add features to the main module and enable the creation of devices with very different capabilities. Connectivity is provided by an Ethernet port and a serial line port, guaranteeing reduced continuous issuing times, extremely important in this kind of applications. Technical solutions applied in the EMTS_E and ENC RISC_E modules allow the creation of devices suitable for very complex applications without sacrificing construction simplicity and ease of maintenance. The EMTS_E module satisfies all needs related to ticketing, access control, pay toll and parking applications. It is specifically designed for those environments where thermal full-graphic ticket printing is required. 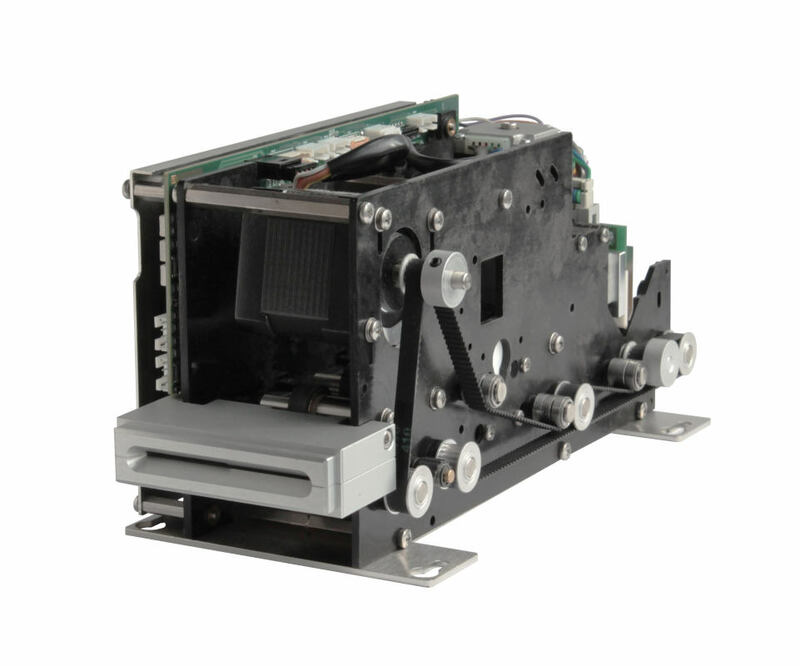 This module is particularly suitable for ticketing applications also thanks to the single/dual/triple feeder and tearing device configurations. The EMTS_E module supports a wide range of magnetic configurations. Its four magnetic tracks can be configured to support different codes and coding densities and its magnetic heads can be placed in different positions, such as ISO standard, central, lateral, up and down. Customizations can also be easily extended to different standards combinations, such as ISO standard magnetic heads on the lower side of the ticket and TRANSAC magnetic heads on the upper side. 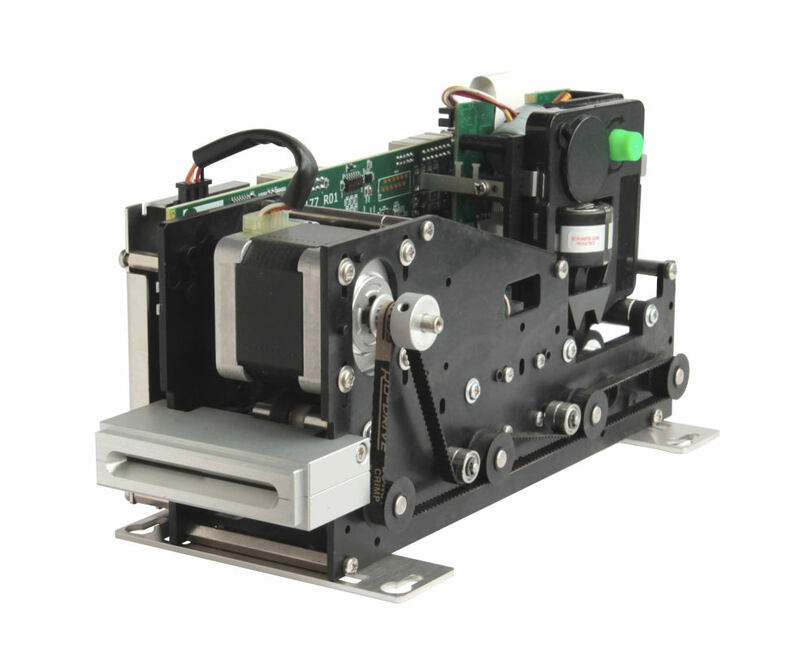 In alternative to the full graphic thermal printer it is also possible to equip the module with a 64 dots 203 dpi thermal printer or with an impact longitudinal printer. RFID contactless cards and contact chip cards are also supported using specific additional modules. The ENC RISC_E module satisfies all needs related to ticketing, access control, pay toll and parking applications but compared to the EMTS_E module it is specifically designed for environments that require thermal or impact printing of a single line. For example, it can work as an issuing machine for pay toll systems, also thanks to the single feeder optional configuration. The module can also be used as a validator for highway exit toll booths, where, combined with the single and dual store units, for just the ticket or ticket and card respectively, it allows the payment of highway tolls. Just like the EMTS_E module, the ENC RISC_E module supports a wide range of magnetic configurations. Its four magnetic tracks can be configured to support different codes and coding densities and its magnetic heads can be placed in different positions, such as ISO standard, central, lateral, up and down. It is also possible to equip the module with a 64 dots 203 dpi thermal printer or with an impact longitudinal printer.